This study presents an industry snapshot, focusing on the Dairy and the Infant Milk Formula sectors as examples. Against the background of current concerns about Shale Gas Hydraulic Fracturing, it looks at how this proposal might impact on the Industry, and the reputation of this country and our ability to retain and increase market share. It asks whether Ireland is in a position to reach a sufficiently informed decision on Shale Gas at this time. 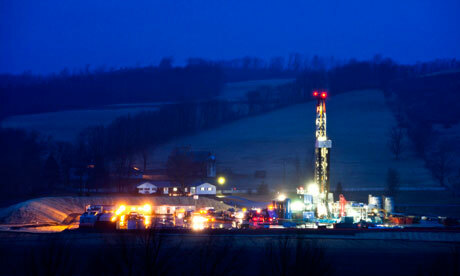 A shale gas operation in a US rural area at night. The food and drinks manufacturing industry is Ireland’s most important indigenous industry with a turnover of €24 billion. Almost 50,000 are directly employed, with a further 60,000 employed indirectly in all regions of the country. The industry also uses 90% of the output of Ireland’s 120,000 farmers. The relative importance of this sector to Ireland is greater than almost all of the other EU countries. The value of exports in 2011 was €8.9 billion. This is a 12% rise on 2011 and follows a similar rise in 2010. The sector accounts for over 2/3 of exports by indigenous manufacturing. (source – all above – Food and Drink Industry Ireland website 2012). The IRG would add that being embedded in the country, this industry, along with tourism, cannot re-locate to another country. Junior Agriculture Minister Shane McEntee said last July “There is an increasing recognition that our economic recovery will be export-led and, in that regard, agriculture and the agrifood sector has a particularly important part to play.”…. “When one considers that approximately 85% of Irish dairy produce is exported, an increasing proportion to emerging markets in the Middle East and Far East, one can see the enormous contribution that the Irish dairy sector can make through a significant increase in exports. “Similarly, the Food Harvest 2020 strategy targeted an increase in the output value of Irish beef of 20% by the end of the decade. However, last week, the Beef Activation Group revised the figure upwards to 40%. Given the sector’s strong export focus, with approximately 98% of Irish beef exports going to high-value EU markets, and the fact that it is employment intensive, that is vitally important in terms of economic recovery, job retention and creation. Teagasc training colleges have seen an 80% increase in enrolments in the past five years and had to turn away 250 people last year. In a 2011 survey of Macra na Feirme members, the organisation for 17 to 35-year-olds, nearly 85% believe that the outlook for Irish agriculture is good or very good. Eighty-six per cent of young dairy farmers intend to expand in the coming years. It is estimated Ireland can feed 36 million people with the food it produces annually. By 2020 it is hoped this figure will have reached 50 million. With grass-based milk production, Ireland is the lowest cost and the greenest producer of dairy products in the EU. Bord Bia is currently undertaking a project that allows the carbon footprint of food production on Irish farms to be calculated. Bord Bia has been rolling out its carbon footprint initiative across more than 7,000 Irish beef farms, with all 32,000 member farms in its Quality Assurance Scheme set to receive their first sustainability audit by the end of next year. Anticipating the EU milk quota being lifted from 2015 all eyes are on the Dairy sector. According to Cork-based dairy farmer Michael Murphy (who is also involved in dairy operations in the US, Chile and New Zealand) Ireland has the potential to quadruple it’s dairy herd, with potentially 45,000 new jobs, over the next 25 years. Will existing dairy farmers and prospective new entrants, in areas licensed or zoned for Shale Gas exploration and extraction, be inhibited from investing? Will potential lending institutions be similarly worried by shale gas zoning, or threats to the industry’s national reputation? These questions must be answered, given that already some people have put planned (so far minor) investment on hold in Leitrim due to shale gas fears. The dairy processing sector is heavily linked to the Infant Milk Formula industry. This provides a strong platform for future growth. Ireland’s Infant Milk Formula industry currently supplies 16% of the world market and 40% of the EU market requirements. (Enterprise Ireland). Three of the world’s top five Formula producers, Abbott, Pfizer and Danone have their biggest manufacturing facilities in Ireland. After completion of Danone’s Macroom plant expansion, which will triple capacity there, the industry in Ireland is expected to achieve 20% of the world Formula market. Agriculture Minister Simon Coveney expressed hope in 2011 that this market share can be increased to 25%. Direct Employment is near 1,400, many of them in highly skilled jobs, and the industry consumes a substantial amount of the country’s dairy output, indirectly supporting thousands more jobs. A number of baby food companies have opened operations in Asia. But Cantwell says there is still a lack of confidence in domestic milk there following the 2008 melamine contamination scandal in China, which led to the deaths of at least six babies and resulted in thousands of infants falling ill.
Donal Courtney, managing director of Danone Baby Nutrition in Ireland, says the excellent workforce and access to high-quality raw materials through the company’s partnership with Dairygold were major factors in the decision to expand. Pfizer‘s infant formula business has grown by 15% to 16% every year for the past 10 years, according to Jim Shorten, managing director of the Pfizer baby food manufacturing plant at Askeaton, Co Limerick. In an address to the Animal and Plant Health Association animal health conference, Mr. Shorten said that the fact that three of the top five major world manufacturers of infant formula are located in Ireland demonstrates our good reputation. ”We are buying raw materials that meet a rigid specification and we pay a premium price. This is hugely important for Irish dairy processors. They get a premium price for a product that costs the same price to produce,” he said. The eColi outbreak in 2011 in Germany, initially blamed on Spanish cucumbers, resulted in an immediate crisis in Spain’s fruit and vegetable exports, with the industry claiming losses of €200m per week. Ireland’s Pork Dioxin scandal in 2008 seriously damaged the industry’s reputation, with 1800 jobs lost within 2 days and the state paying €130m compensation to date. levels in Irish butter destined for the German market. It would be good to be able to say that we can rely on research to date in the United States to inform a decision in Ireland. Yet, to take one example, The Solid Waste Disposal Act of 1980 prohibits the EPA from regulating drilling fluids, produced water and other waste associated with exploration, development or production of crude oil or natural gas as RCRA Subtitle C (hazardous) waste. Similarly, the gas industry in the US has been exempted from the Clean Air and Water Acts, further inhibiting the collection of scientific data with which to inform policy decisions. Add to this the fact that horizontal high volume shale gas fracturing (as distinct from earlier vertical fracturing) is only about 10 years old, with most drilling sites much younger than that. (A. Ingraffea, Prof. of Civil & Environmental Engineering, Cornell University). A vital necessity for Agriculture, and other industries including Pharmaceuticals, is a predictable long-term supply of clean safe water. We have been assured that there will be no mis-haps, either underground or surface. But a year-long investigation by The New York Times has exploded the gas industry’s decade old mantra that “there is not a single documented case of drinking water being contaminated by fracking”. The Times investigation of EPA archives exposed this claim as demonstrably false. In addition to the danger of methane migration into water supplies, many of the problems in North America have occurred due to surface spillage of waste-fluids on-site, in storage and in transport, and there is no historic basis for expecting that there will be no road accidents. Leaving aside the question of introduced chemicals, experience shows that existing compounds, such as radium, radon, brine, heavy metals, are brought up with the flow-back fluid. The New York Times reported “Sewage treatment plants in the Marcellus region have been accepting millions of gallons of natural gas industry wastewater that carry significant levels of radioactive elements and other pollutants that they are incapable of treating.” (This is based on factual reporting using official records, all cited, which in spite of much PR from the gas industry has not been refuted). The fracturing process is known to impact the physical environment including roads, landscape, and not least air quality. These effects include exhausts from compressors and motors running around the clock for several days, with flood-lighting, and thousands of truck journeys, associated with each well fracturing event. Exhausts can combine with VOCs in the presence of heat and sunlight to produce ground level ozone, highly toxic to human and animal health. (see further reading 2 below). In addition, accidental escape of very fine sand particles/silica (used in the fracking fluid) can be wind-borne and can cause lung diseases such as silicosis, cancer and auto-immune diseases. These activities also cause significant noise levels. While dairy cattle will be used to a certain level of machinery noise, they may still be adversely affected by round the clock noise and floodlighting in the vicinity of wells, even relatively distant ones. Beef and suckler herds may be far more effected, and horses much more so. And let’s not forget farm staff, doubtless affected by these night and day disruptions. Livestock farming is a rural occupation, not usually associated/compatible with an urban environment. Yet experience shows fracking can create levels of air pollution in the countryside comparable to cities, and it must be questioned if this is conducive to clean/green farming or the reputation of the industry nationally. In this context let us return to our Pork Dioxin crisis: the Review Group reported inadequacies in the regulatory and inspection regime. If this can happen with a long-established industry, how can we be prepared for a new process whose long-term implications are as yet barely known or understood in it’s country of origin. Up to €4.9 billion equals an average of up to €140m per annum over 35 years – would that cover the cost of adequate regulation, inspection, legal fees and road repairs, social costs, to mention just some? Set against current and planned/potential employment and foreign exchange earnings for food, drinks, and infant formula the above potential shale gas benefits are negligible. The British Geological Survey has put the likely recoverable Shale Gas in Lancashire at less than 0.47 trillion cu. ft., which is 1/400th of Quadrilla’s stated estimate of 200 trillion cu. ft. (Guardian April 17th 2012). Employment in Tourism is an important element in the rural and national economy. If only a 2% sales drop (from current figures) in the above industries’ earnings occurred over the next 35 years it would mean a loss of c. €8.2 billion. and job losses of 6000. A 5% sales drop (from current figures) would cost €20.5Bn over 35 years with 14,500 jobs lost. In addition projected growth in sales and employment would be lost. With our dependence on our clean green image, it is prudent to question if the losses might not be far higher. And to increase shale gas revenues by expanding the regional coverage will surely have the effect of correspondingly greater losses in exports and jobs. In addition to our commitment to the inevitable move towards renewable sources we need to consider the following. 40% of our energy is used in domestic dwellings. That is a huge amount, and offers a big, clean and safe opportunity. An investment in conservation measures could employ thousands who are already skilled at building, without any environmental risks, and help meet our emissions reductions commitments. The energy benefits to be derived from conservation are permanent. Household energy costs will be cut, freeing up money for spending with consequent jobs multiplier effects. There is optimism and enthusiasm for long-term sustainable growth in revenues and employment from Ireland’s Agriculture and Food Industry. 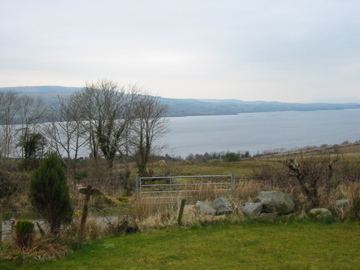 This is dependent on preserving Ireland’s reputation as a green, clean environment. There is at present insufficient independent scientific data available anywhere to make a decision on shale gas. In the meantime, the Precautionary Principle must apply. The gas will still be there in 30 years time. Given the controversy surrounding the shale gas industry, there should be no requirement on the part of Irish people to prove anything. The Burden of Proof must lie entirely with the industry. In the light of the temporary and relatively minor shale gas benefits, might we not more sensibly use our huge food export growth potential to pay for imported energy while we build alternative energy infrastructure. We would be doing so soon enough anyway when the shale gas runs out. Energy conservation may offer far greater long-term sustainable benefits (energy, jobs) than shale gas. Shale gas reserves do not obviate the need to move towards renewable alternatives – it is not an either/or choice. Shale gas will be openly sold at market prices, and therefore will not, in an economic sense, substitute for energy imports. Does Shale Gas actually solve anything, while it risks huge problems? There needs to be Joined-Up Thinking on this whole issue. It needs to be established if there are any Net Benefits. Our page News and Articles includes further items of economic relevance for this country……..